Is Monday ‘Just Another Day’ For You? Do you know what this coming Monday is? Does it have any significance for YOU, or is it “just another day”? If you don’t know, or if it’s “just another day” for you, that’s probably good news. This Monday is the first Monday in September which means that it’s Labor Day, the national holiday created over 100 years ago to celebrate the achievements of American workers. We have several Relaxing Retirement members who will not be celebrating this year for the very first time! What I mean by this, of course, is you’re no longer ‘working’, so you don’t need a national holiday celebrating labor to give yourself a day off. You’ve now earned the right to take EVERY day off for the rest of your life if you choose to do so. If you’ve just entered this elite group, or if you’re already there, take a moment to reflect on just how incredible an accomplishment that is. You’ve put yourself in a position to no longer need to work to support your desired lifestyle for the rest of your life! Historically speaking, this is an extreme rarity. Remember that the whole concept of “retirement” (i.e. living without “having” to work for the income you need to support your desired lifestyle) has been around for less than 100 years, and for a good chunk of that time, it was only for the super rich! Prior to that time, you worked until you passed away, or until you were unable to physically and your family supported you. Social security statistics consistently confirm that only 6% of Americans achieve complete financial independence and continue their lifestyle into their retirement years, while 94% do not. If you’re in that top 6% group, you’re in a very special MINORITY. Be incredibly proud of that! Group One: You’re working, not because you have to, but because you still ‘want’ to. You’ve done all the analysis you need to do and you know you don’t need to work for income, but you still enjoy what you’re doing so why give it up. 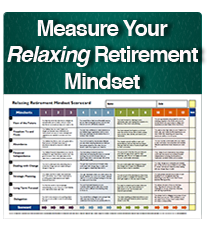 We have several Relaxing Retirement members in this category too, and I think it’s terrific. Just because ‘society’ defines “retirement” as no longer working doesn’t mean that you have to live that definition. As I’ve shared with many of you, I will never “retire” by society’s definition. All without having to depend on the income from “work” to support your lifestyle. If you’re in this camp, the question I have for you is how do you know? If you’ve done all the analysis necessary, and carefully determined that you still need to work, that’s great. You’re making the decision to continue to work based on fact, not emotional opinion or media manipulation. However, in my experience, I’ve encountered far too many individuals who are still grinding it out every day, not because they want to, but because they believe that they still ‘have‘ to. And, the reason they think they ‘have‘ to is rarely based on careful analysis and fact. The answer for all of these conditioned beliefs is “maybe”. Maybe they’re true for you, and maybe they’re not. None of these statements is a universal truth. The answer lies in your personal numbers because everybody’s priorities and resources are drastically different. Over the last 25 years, I’ve worked with countless numbers of individuals who have “grossly underestimated” their ability to stop working if they want to, only to find out that they could have stopped working one, two, or three years ago, but they didn’t know it. Imagine finding out that you could have afforded to comfortably stop working 3 years ago if you chose to, but you didn’t even know it. Don’t fall into that trap. Take the time to rationally understand your own personal numbers to the point where you can confidently make educated decisions, instead of basing your life decisions on erroneous ‘rules of thumb’ or ‘outdated’ conditioned beliefs. As anyone who has achieved complete financial independence will tell you, knowing that you don’t need to work changes EVERYTHING.